A couple of days ago I posted a link to the short video “BOOM – North America’s Explosive Oil-by-Rail Problem”. It discussed the hazards raised by the increasing use of trains to transport oil. What they didn’t really review was how much energy is ‘tanked up’ in those train cars, the fragile DOT-111 used for crude oil and the somewhat better DOT-112 cars that are used to transport Liquid Petroleum Gas (LPG), basically liquid propane. I thought it would be useful to share some of the numbers and provide some comparisons. A single DOT-111 rail car carries about 30,110 US Gallons of petroleum crude oil. This is the equivalent of 113,797 liters. It takes about 42 US Gallons or 159 liters to equal a Barrel of Oil Equivalent (BOE). A BOE has an energy of about 5.8 million BTU. We will use BTU (British thermal Units) as our reference energy unit. So what is the total energy contained in a single DOT-111 car carrying crude oil running through town? About 4.15 billion BTU. Well that’s a big number, but how does it compare with some other energy sources we might be familiar with? We will need to think big, because it turns out this is a lot of energy. Let’s start with the idea of a kiloton of energy. A kiloton is the energy released by 1,000 tons of TNT. Kiloton is a term often used to describe the relative size of atomic bombs. For example the atomic bomb, “Little Boy“, that was dropped on Hiroshima in 1945 released 16 kilotons of energy. A kiloton is equal to 4 billion BTU. The energy in a single DOT-111 tanker filled with crude oil is 4.15 billion BTU – about a kiloton, 1,000 tons of TNT. That means about 15 rail cars with crude oil are about equal in energy release potential to the bomb that was dropped on Hiroshima. The bomb dropped on Nagasaki, “Fat Man”, was a little larger and yielded about 20 kilotons, or about the equivalent of 19 fully loaded DOT-111 tankers. But there is a difference between 15 DOT-111 rail cars filled with crude oil and “Little Boy”. The type of energy released by an atomic bomb is about 50% blast energy, 35% thermal energy and 15% nuclear radiation. Even 15 tankers would not release the same blast of energy as an atomic bomb in a similarly short time, so there would be much less damage at a distance. But left to burn the energy released by 15 tankers would soon match that of the Hiroshima bomb. And while there are typically more than 100 DOT-111 rail cars in a single train passing through Parry Sound, about 7-plus “Little Boys”, it is unlikely that more than a half-dozen would derail and ignite. The derailment and explosion of DOT-111 rail cars would also not have the long-lasting radiation contamination associated with an atomic bomb. Rather we would be dealing with the contamination of oil and oil residue that would likely flow into the Seguin River, and certainly find its way into Georgian Bay. While the immediate damage of the blast and the fire would devastate the town, the long-term contamination of land and water would be even more destructive. While fifteen DOT-111 tankers derailing and exploding in Parry Sound might release the same energy as “Little Boy”, the impact really wouldn’t be the same. A better analogy might be the longterm devastation caused at Chernobyl where the impact was less related to the blast than the radiation contamination. No it’s not the same type of contamination, hydrocarbon rather than radiation pollution, and the contamination impact of a derailment and explosion in Parry Sound would be much more localized, but it would be equally long-lasting. Ever wonder why the Imperial Oil properties are walled off and off-limits? They don’t want to deal with the contamination caused by their industrial use of the properties for a few decades. Imagine a derailment and explosion. Let’s hope that the Federal Government and the railways get their act together and start tightening up how they transport crude oil through Parry Sound and the rest of Canada. It seems that industry and governments have been slow to respond to the lesson we were presented in Lac-Megantic. But then again how responsive have industry and governments been to the evidence we are experiencing climate change? So keep your eyes open for the tags on the tanker cars that roll through Parry Sound. The 1267 and 1268 tags are used for “Petroleum crude oil” and “Petroleum distillates, n.o.s. or Petroleum products, n.o.s.” respectively. That’s what you’ll see on the long trains running through Parry Sound. 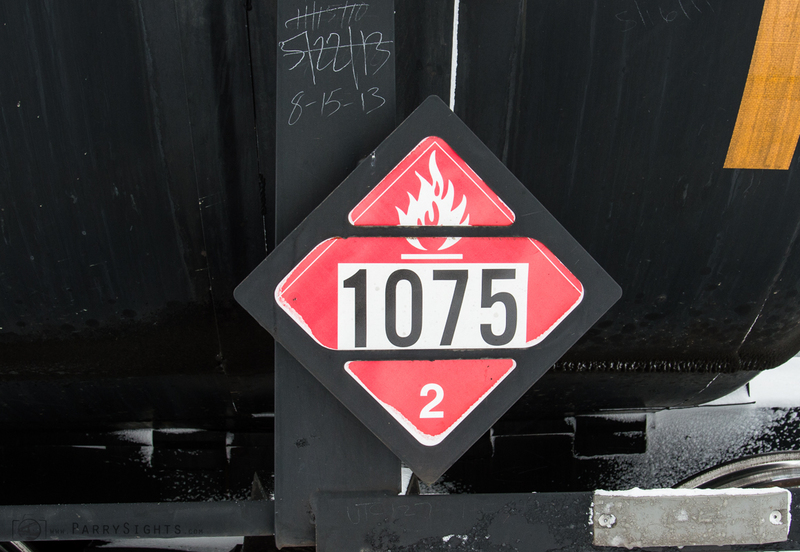 If you look closely you’ll also see 1075 labels on the safer DOT-112 tankers spread among car carriers and containers. These tankers contain “Petroleum gases, liquefied or Liquefied petroleum gas”, they contain about one-third the energy of the DOT-111s containing crude oil. Less energy and less contamination potential in safer tankers. It seems things can be managed for public safety, but only if there is the will to do so and Big Rail and Big Oil are willing to accept slightly higher costs. Addendum. A single DOT-111 contains about two-thirds the energy that was released when the Zeppelin – LZ 129, the Hindenburg, exploded in Lakehurst, New Jersey in 1937. What seemed like a good idea, transporting with hydrogen filled ‘bags’, turned out not to be such a good idea. So when the crude oil express rolls through towns think of it as a string of 80 or so Hindenburg zeppelins rolling through town. There may be a lesson here. Or perhaps not. Life presents us with the same lesson again and again, until we decide to learn and understand. Sort of like “Groundhog Day“. Good posting & great information.